Reblogged from The Trailers From Hell! One of my all-time favorite films and Allan Arkush gave it a marvelous perspective. Thanks for focusing on one of my favorite classics! work in ‘His Girl Friday’, ‘Bringing Up Baby’ and ‘The Thing from Another World’ are excellent examples. So is Hawks’ choice of women opposite the leading man. Katherine Hepburn radiates confidence as is more than up to the task in ‘Bringing Up Baby’. Rosalind Russell easily holds her own in ‘His Girl Friday’. Yet, two actresses who do not get enough loving are Margaret Sheridan’s Nikki in ‘The Thing from Another World’ and Joanne Dru’s Tess Millay in ‘Red River’. You’re so right, Kevin. And you’ve named a number of other favorites of mine in your splendid comment. All of these actresses you’ve named are in class by themselves. Thanks very much, my friend. love this video clip Michael. This is another one of my faves that no matter what is going on around me, I take a moment to watch. I wish that today’s screwball/rom-coms had about a fraction of what this film has. And it goes without saying that Grant was a fantastic actor. One fault – the poster – the Rosalind Russell character drawing sure does look a bit like Claudette Colbert. It is a great clip with a splendid commentary by Allan Arkush. 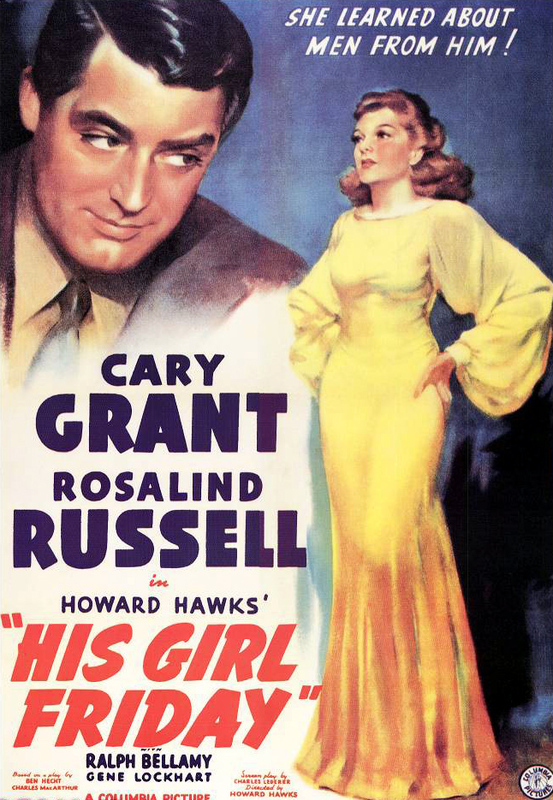 It’s such a marvelous film by Howard Hawks and certainly is a situation where the remake (Hawks’) is superior to the original. You’ll get no argument from me on that! You’re right about the poster, too. And it doesn’t match any scene in the film, as well. Thanks so much for the comment, Iba. I’ve never seen this movie. I’d heard of it, but it was never really on my to-watch list. It is now. And I just checked to see if my local library has the DVD. They do, so maybe I’ll watch it next weekend. Thanks for bringing it to my attention. I think you’ll appreciate this classic, John. Please let me know how it goes, my friend. Thanks. The man was somethin’, alright. Thanks, Ruth.